You’ve had a nasty shock, taken a long hard look at your life and decided to change. That’s a really positive move but where do you start, how do you deal with sceptical partner or family and how do you keep going when you’re getting no support and perhaps downright hostility? In my compassionate book, I will help you understand yourself better and create new habits that will lock in the change. Whether your partner is threatening to leave or you’ve discovered infidelity in your relationship (and nothing makes sense any more) or you’re fed up with being single, I have thirty years of experience helping couples and individuals turn round their lives and a proven plan to transform your life. My main focus as a Marital Therapist is changing your relationships – with yourself, your partner, parents, siblings, friends and work colleagues. However, the ideas are equally helpful if you’re going through a seven-step programme and need to reassess your life and find a way forward without the crutch of drink, drugs, gambling, eating disorders and suchlike. How is Wake Up and Change Your Life different? There’s no shortage of books offering advice or personal testimony about change but this one is different. I’m interested in lasting rather than superficial change. That’s why I’m going to dig deep, explain why change is hard and how, despite our best intentions, we often slip back into the same rut again. However at the same time I am intensely practical and used to delivering real change on the ground, week-in and week-out and helping my clients cope when it seems they’re taking one step forward and two back. Each chapter is built round a particular maxim. Think of these as like neural short cuts to a huge body of knowledge that I’ve boiled down into a simple sentence – rather like icons on a desktop to connect you to a particular way of looking at the world or a new skill. As we lead busy lives with lots of demands on our time and many distractions, I’ve pulled all these maxims together at the end of the book to help you keep them conscious, to overcome old habits, automatic thinking and unhelpful messages from the past or our general culture. There are also lots of exercises to help you bolt in the change. I’ve spent thirty years helping couples and individuals cope with change – some of their own making but more often it was thrust upon them. I’ve also had to deal with all sorts of changes myself. I’ve lost jobs that I put my heart and soul into. I’ve lost people that I loved dearly. Despite the pain on the sofa in my counselling room and my private life, I have a positive message – change doesn’t have to be so scary – you do have choices and this fork in the road could be the making of you. If you feel stuck or there’s a gun being held to head and you’re being told to change or else – then I can help too. You still have choices, although they don’t feel particularly attractive at the moment, and you certainly don’t have to just “accept the situation”. As I will explain, there are a whole load of new skills that will not only to get you out of this hole but also transform your life. Andrew Marshall’s book is an insightful and gracious walk through creating positive change in your life. It is well written and helps the reader to truly understand the dynamics of personal change. His writing and wisdom teach and touch at the same time. I highly recommend, Wake Up and Change Your Life, to everyone sitting on the fence and wondering if they can overcome their fear to change. Robert J. Ackerman, Ph.D., author of Perfect Daughters, Silent Sons, Before Its Too Late, editor Counselor Magazine. Change is difficult. That’s why most of our resolutions to change end up being short-lived. But there is a way to make change long-lasting, and in his new book, Andrew Marshall shows you how. No matter where you are on your journey, this book will provide you with an important resource for creating and sustaining positive change in your relationships – and your life. Alan Fox, entrepreneur, philanthropist and author of People Tools for Love and Relationships. 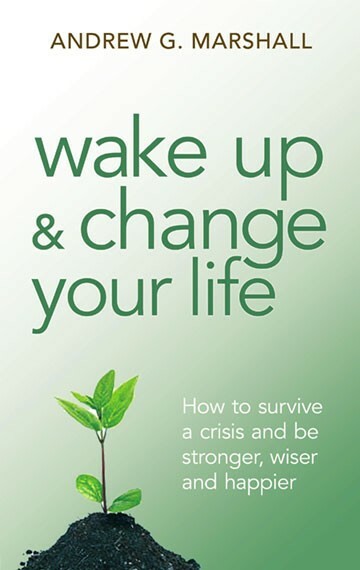 Wake Up and Change Your Life is the rare book that delivers more than it promises. We all face challenges in our personal and professional lives that can seem overwhelming. Andrew G. Marshall offers deeply insightful, helpful, and practical tools for dealing with most of the challenges we face. Not only does he offer helpful tips for dealing with everything from a broken marriage to finding a new job, he offers simple, yet powerful, maxims that can be used to deal with all aspects of change in your life. If you’re going to read one book this year, I highly recommend Wake Up and Change Your Life if you’re really ready to wake up and change your life. Jed Diamond, Ph.D., author of Stress Relief for Men and The Irritable Male Syndrome.